PANDORA's classic sterling silver charm bracelet has gained a fashionable update thanks to the rose-coloured barrel clasp. 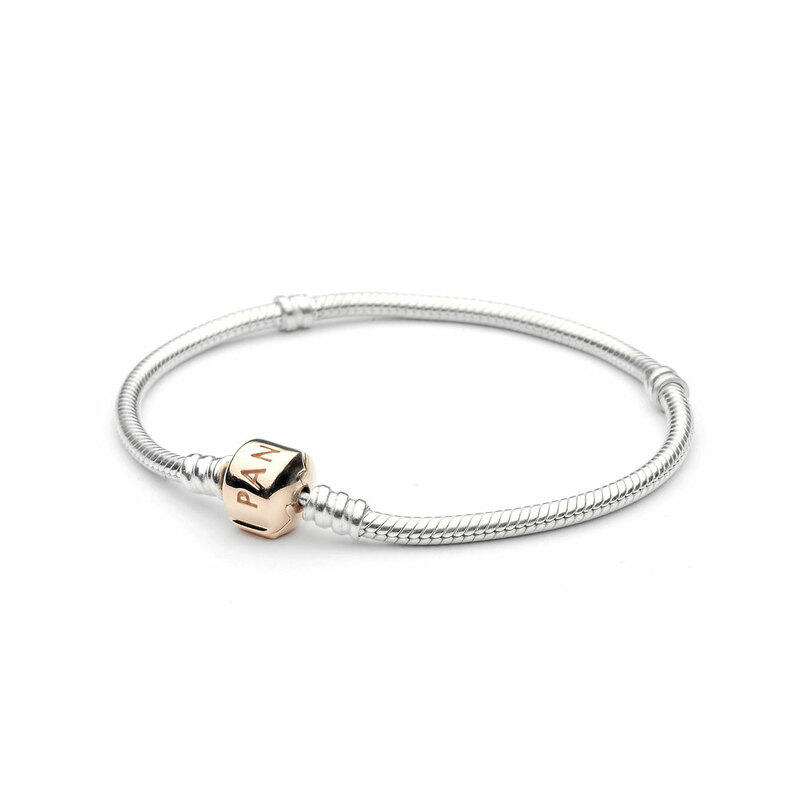 With its beautiful two-tone look, this stylish bracelet matches any metal colour and is the perfect carrier for your personal selection of charms. PANDORA Rose is a unique blend of metals with 14ct rose gold plating. This gorgeous bracelet is available online and concept stores only. PANDORA Rose MOMENTS Silver Bracelet with Rose Clasp is rated 4.7 out of 5 by 74. Rated 5 out of 5 by Dnelson443 from Bracelet with charm excellent I love this bracelet with my feather charm. It reminds me of an angel feather and having faith and courage. The only thing I wish Pandora would do differently is have a frequent buyer card. I have purchased so many charms but never get a bargain. It would be nice to get a few free from time to time. Rated 2 out of 5 by Julie01 from Really cute, but pinches hairs! This bracelet is so cute, but the braided band keeps pinching my arm hairs. I didn't see any other complaints about it, but it is annoying to say the least. I have another bracelet that isn't braided and it doesn't do it. I am going to get a new one to match my rose gold charms. Otherwise it is cute! Rated 5 out of 5 by Still a Phillies Phan from She Loves It! I bought this bracelet for my wife at the end of the summer and she adores it. She almost always wears it when we go out, and she sometimes just wears it to work. It's becoming one of her most called-upon pieces of jewelry. Rated 5 out of 5 by Jmy1973 from Stylish bracelet I'm very happy with this bracelet as it can be worn with any color or outfit and look good. Rated 5 out of 5 by Johnsita64 from Beautiful Bracelet I bought this bracelet last year for my birthday. I lost one of the rose gold clips and when I went to the store, that clip was no longer available, but then the sales associate told me to do the missing clip in silver and I have now been building my bracelet with silver and rose gold charms. I love the runner shoe and my son just bought me the rose gold clip safety! Love Love Love it! Rated 5 out of 5 by karab from first pandora bracelet My Dad surprised me with this bracelet for my birthday. I've been wanting to get myself one for sometime now. I'm so happy and i'm a sucker for rose gold! Rated 5 out of 5 by LCoops from Love Rose Gold So happy with the bracelet especially the rose gold charms.